We Can BC is the local branch of an international campaign to end violence against women. This year, as part of the 16 Days of Activism Against Gender Violence, We Can BC is helping to bring the Ghosts of Violence ballet to Vancouver. The haunting, emotionally-charged piece is inspired by women in violent relationships who have lost their lives at the hands of a partner. I spoke with project coordinator Anastasia Gaisenok about the the unique event which will be coming to Vancouver in December. How did this idea come about/how was the event put together? "The Ghosts of Violence Ballet was inspired by Silent Witness Project in New Brunswick, which is a travelling exhibit of red wooden silhouettes representing women murdered by their partners," said Gaisenok. She said the ballet was created to take this idea further to create a living legacy, and to serve as a catalyst for public dialogue and action. After a successful premiere in Ottawa in February of this year, the ballet is now on a national tour across Canada. Asked how this dance figures into the We Can BC campaign, Gaisenok answered that her organization usually plans around significant dates: 16 Days of Activism to End Gender-based Violence (Nov 25 - Dec 10), International Women's Day (March 8) and Violence Prevention Week (third week of April). "We were thrilled to be approached by the Atlantic Ballet Theatre of Canada with a proposal for partnering on this extraordinary event in Vancouver," she said. "It offers a unique opportunity to engage the public on this serious issue through art." She added that the tour dates for the dance fall within 16 Days, which makes it a perfect fit for what We Can BC does every year. "The ballet itself is a spectacular multimedia production," Gaisenok said about the dance. "Music by Schnitke and Rachmaninoff adds a whole different dimension to the level of emotional intensity brought through dance and videography." The innovative ballet piece follows couples from different socio-economic backgrounds dealing with domestic violence. "I think it is quite unique in bringing such a difficult issue at the centre of the stage," she said. In addition to the performance itself, there will be a number of auxiliary events, or what we call a secondary program. We want to create an interactive experience for the audience, as well as to offer opportunities for dialogue and interaction. Each show will be followed by a dialogue with the creators of the ballet, as well as local community groups and organizations that work on addressing violence in our community. Other components will include a mini-Shoe Memorial in memory of all the women who died as the result of violence (full Memorial is staged each year at the Vancouver Art Gallery on December 6th by a local grassroots group); a photography exhibition and a multi-media installation by Vancouver youth; and displays from local organizations that work on this issue. Also, we are planning to hold several workshops prior to the show on Saturday so that activists, artists, and all those interested can share their knowledge on new and innovative ways of engaging for violence prevention. "I personally did not choose this issue, it chose me through a social justice activism path," said Gaisenok on her reasons for working with We Can BC. She explained that the campaign began as a project, then "became somewhat of a lifestyle." "We Can was first launched in South Asia in 2004, but it quickly grew around the world, as unfortunately gender-based violence is the reality faced by women everywhere, including Canada," she said. "Once you are aware of this reality and start seeing what contributes to it and what can be changed, it becomes a part of your daily life. This is what being a Change Maker is all about -- paying attention and challenging the attitudes, believes and behaviours that perpetuate violence against women in our society." "We hope that people will come out to see the performance, and will also use it as the opportunity to educate their friends, family and colleagues about the issue," Gaisenok said. "We are asking all our supporters to commit to selling five tickets through their social networks, and to consider sponsoring low-income members of the community who cant afford the ticket. We Can supporters get a special discount through promo code WCBC (Tickets can be purchased online through We Can BC)." "We also hope that this event will inspire people to take action," she said, "and they will become Change Makers as well." To learn more about the We Can campaign and to register as a Change Maker visit www.WeCanBC.ca. and SFU Woodward's Cultural Program. Bring your sketchbook everywhere. Catalogue anything and everything that inspires you. Write down your ideas and never think that just because you are done school means you stop learning. 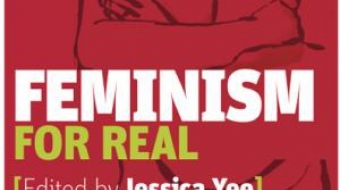 This year's must-read is Feminism for Real: Deconstructing the Academic Industrial Copy of Feminism, edited by Jessica Yee, founder of the Native Youth Sexual Health Network.